According to the US Consumer Product Safety Commission, during a 10-year period, from 1991 to 2001, over 24,000 children in the United States were injured when they inserted foreign objects into electrical receptacles. Every year at least 2400 children are injured when tampering with electrical receptacles. On average seven children per day (mostly boys under age three) are treated in emergency rooms for injuries due to contact with electrical outlets. Typically, these injuries occur at home and are caused by inserting common objects such as hairpins, keys and paper clips. Most victims experience 1st-degree or 2nd-degree burns-but more serious injuries also occur. The number of injuries is significant and demonstrates the need for more protection. 2008 National Electrical Code (NEC) requires all new construction residential receptacles to be tamper resistant. Unfortunately, Chicago and many surrounding towns and villages haven’t adopted 2008 code yet, leaving the responsibility of child proofing the outlets up to the homeowner. That doesn’t mean you can’t have these “child-safety” outlets installed on your own. The Code only sets the minimum standard. Do it yourself (take a look at the picture above to figure out how to wire them) or call us at 312-404-6948 for a free consultation and a free quote. New parents who are baby proofing their home normally use plastic outlet caps over the electrical outlets to prevent contact with live electrical parts. Plastic protector caps can be easily removed by children as young as two years of age and can pose a choke hazard. 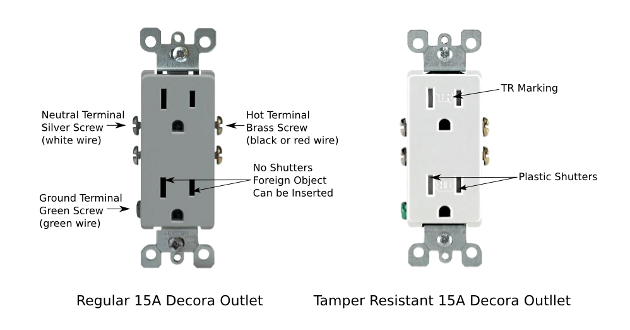 Tamper resistant receptacles are safer than plastic outlet caps or sliding-shutter wall plates (which may cause potentially dangerous heat build-up). Don’t use tamper resistant wall plates. Underwriters Laboratories (UL) has withdrawn its listing from them. Tamper resistant outlets are the best solution. Once installed they offer permanent and continuous protection (unlike the plastic outlet caps) and also automatic protection whenever a plug is removed.